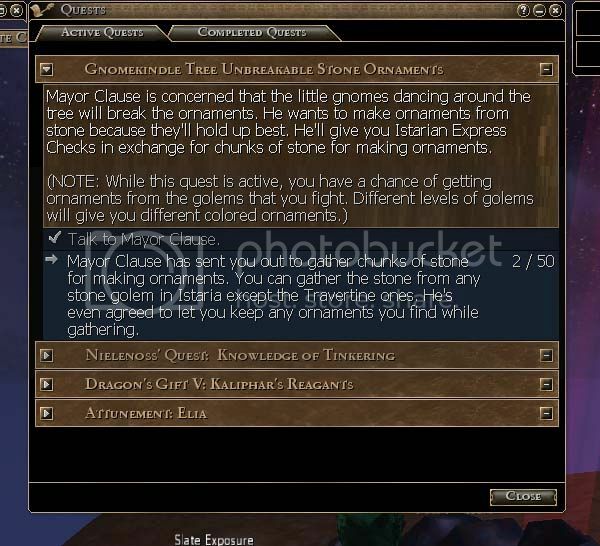 the next questgiver we will meet is mayor clause. 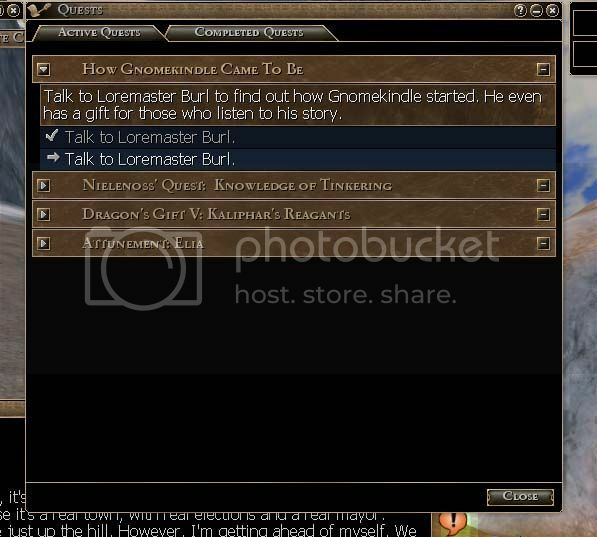 this good leader of gnomekindle, town and event, offers much the same quests as burl. 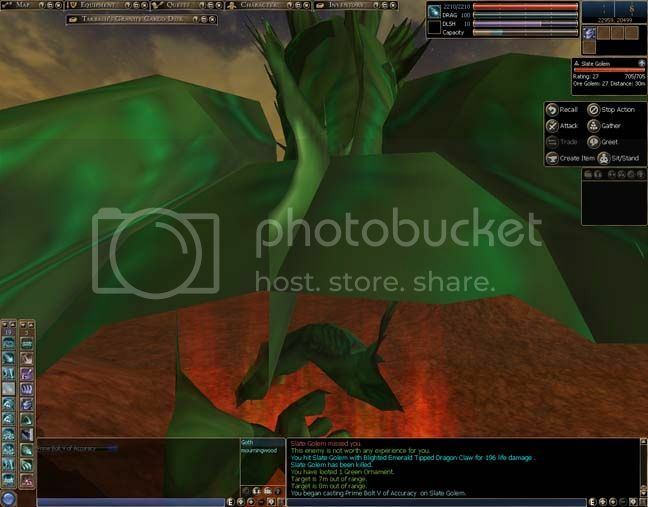 in doing one of the quests, i took an attunement tour, which i will happily share with you! one finds the mayor at his residence, just above the lake. when you speak to him, you see he offers 2 quests - one a storytelling and one a repeatable. 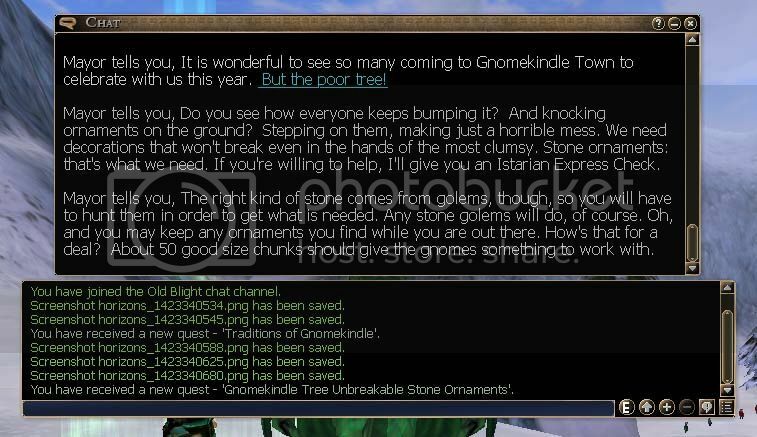 first, we choose the story - traditions of gnomekindle. as your quest journal tells you, all you have to do is listen to the story. 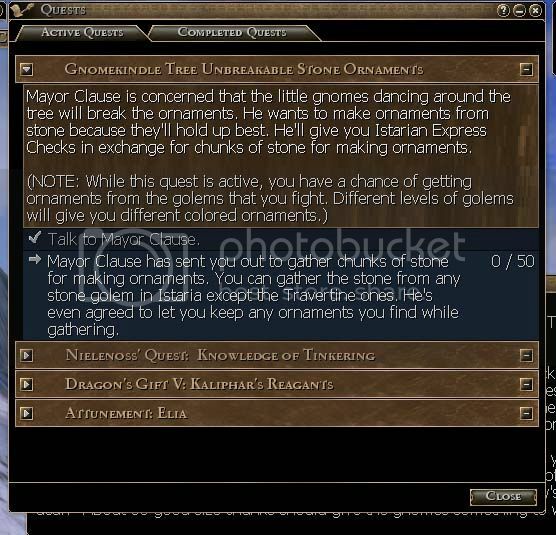 the mayor's repeatable quest requires that you harvest stone for the making of stone ornaments. as with the wooden ornament quest, this requires that you harvest 50 chunks of stone from stone gols, as both your quest journal and the mayor's speech. 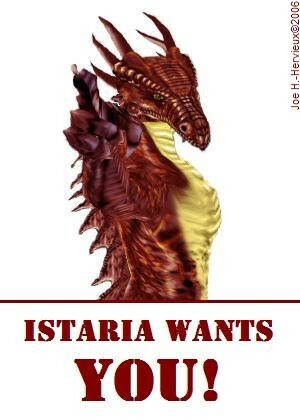 your reward for hunting down the material, aside from the loot, is more istarian express checks. 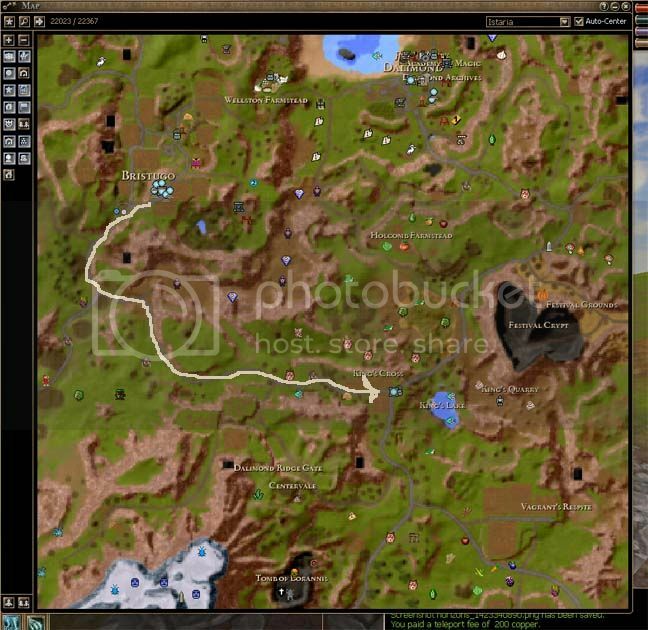 once i decided to hunt slate gols for this quest - i didn't want to spend all that time on hunting the harder stuff, which turns out kinda ironically funny, all things considered - and ported to brist, i realized that i was not attuned to any of the dalimond ports that were nearby the major slate gol grounds. since i would have to pass by several ports anyway, i figured i might as well attune to them on the way. 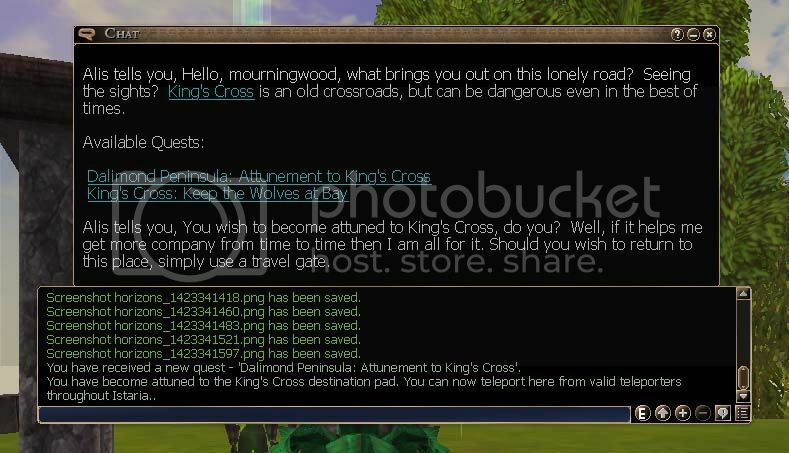 the first gate i attuned to was king's cross, almost directly east from bristugo. 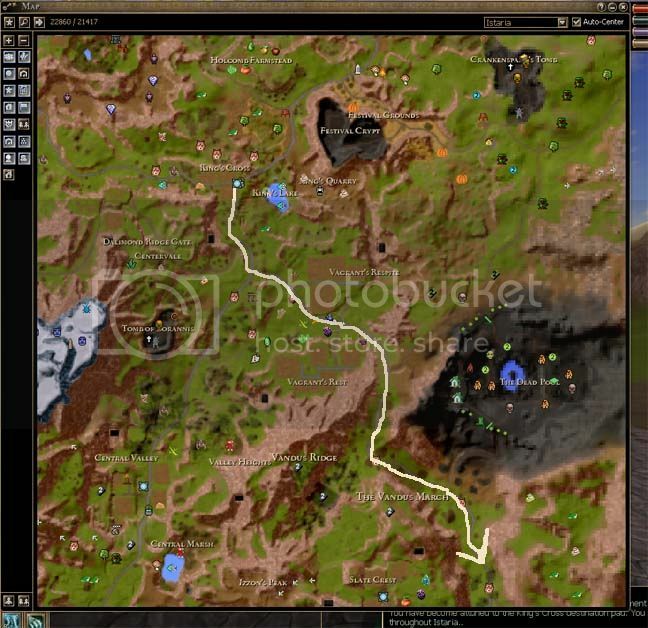 on the way, you will pass the amethyst mine and moham hintos, who offers quests, if you are in the way of taking them - otherwise, he serves as a 'signpost' for the right road. when you reach king's cross, seek out private alis talor and speak to her to get the attunement you seek. after king's cross, head southeasternly to slate crest. you will pass a couple blighted areas, so watch out for minions of the wa, like diseased wolves. you will note the blighted plants as well. slate crest is the community just below the slate field. to attune to the gate there, speak to albus torrin. the private will confirm your attunement. once you have your attunement, head for the slate field. from the guardpost, go up the pass. at the top of the cliff you will find a large field of slate nodes, guarded by slate gols, including slag, the named boss. keep an eye on your journal as you harvest the stone chunks and don't forget to loot any ornaments and presents you come across. 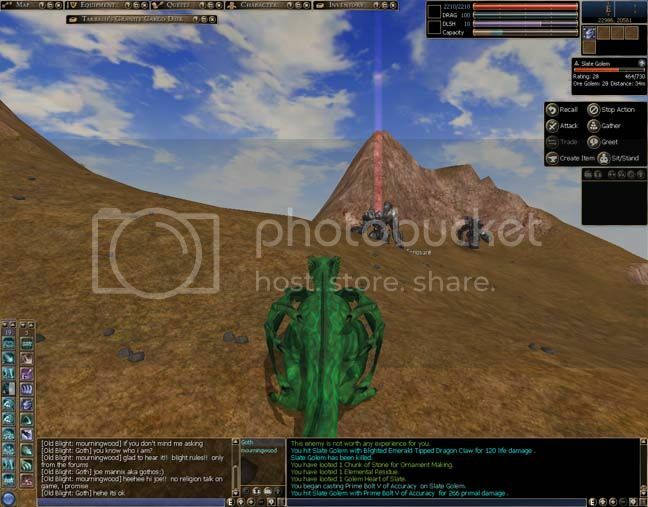 usually, my prime bolt was enough to bring down the chosen gols, but they were, in any case, very easy to hunt. 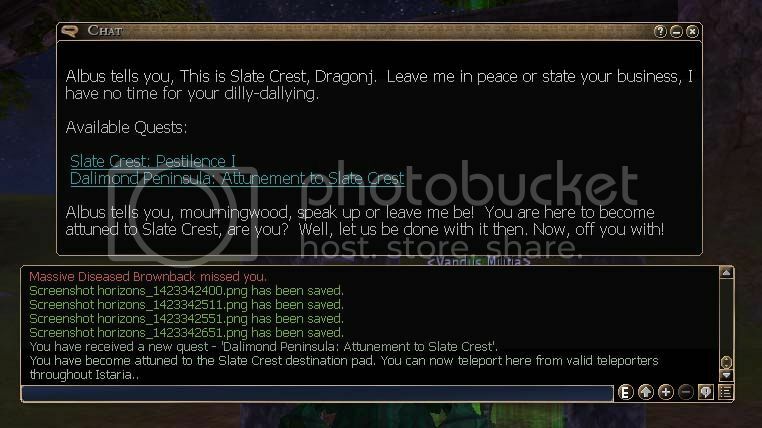 of course, your journal and chat log will inform you when you have enough stone for the mayor's purpose. but don't head back to new korealia just yet. 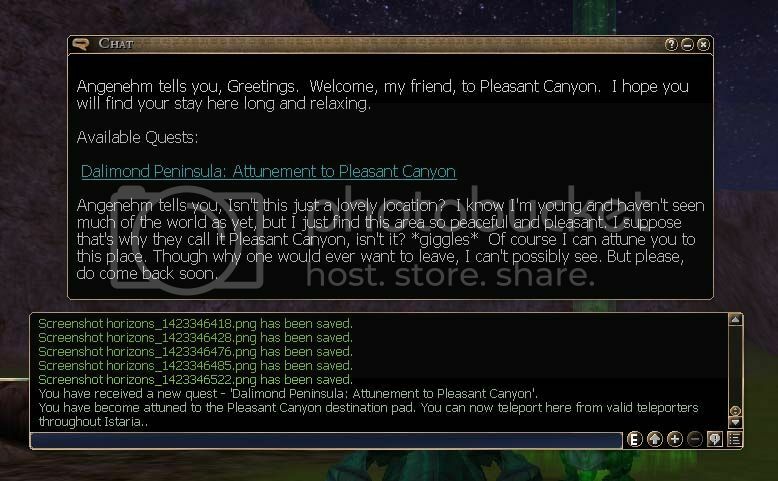 if you drop off the edge of the slate field and glide (assuming, of course, you are a draggy) a couple times, you will reach the pleasant canyon port pad. next to the pad, you will find angenehm the dragon, guardian of pleasant canyon. 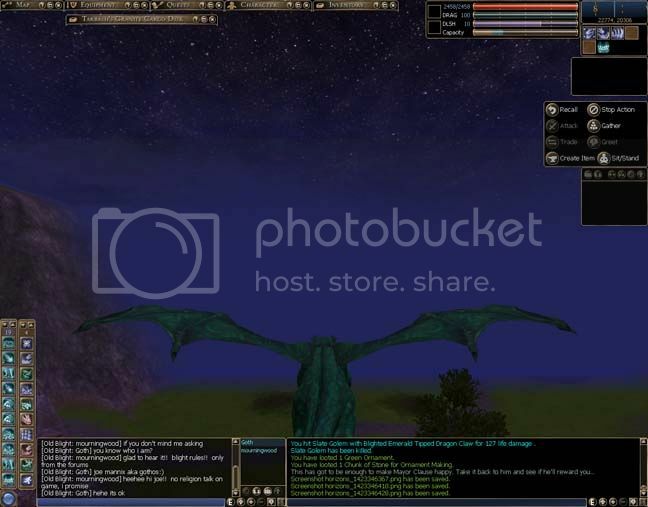 speak to the hatchie to get your attunement. 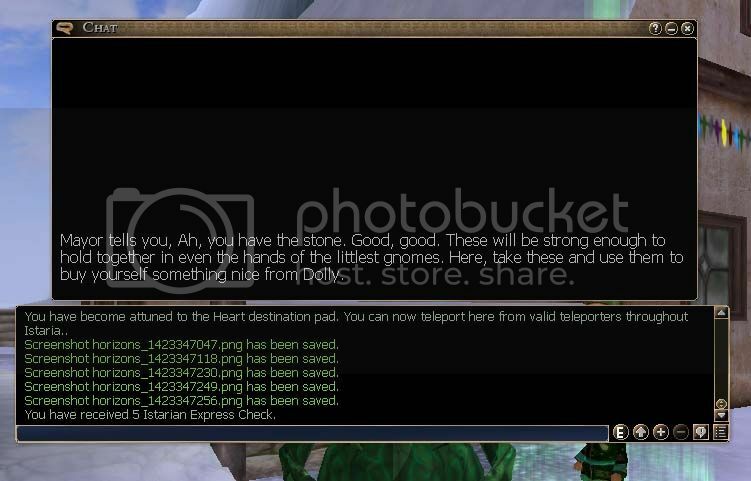 rather than recall, i decided to go to heart, since it was so close, to attune and use the outgoing portal there. run and glide - there is no direct road from pleasant canyon, not to mention a safe one - until you reach sergeant nansi illos' guardpost. speak to the sarg and get your attunement before you head back to the mayor. 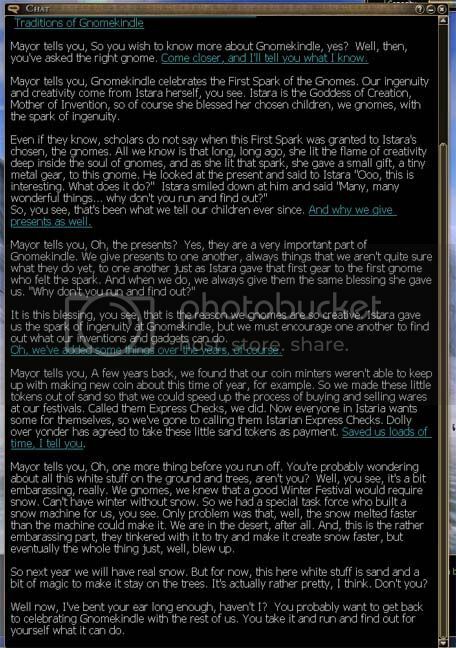 when you get back to the mayor, speak to him and give him the chunks, so you can get your reward. 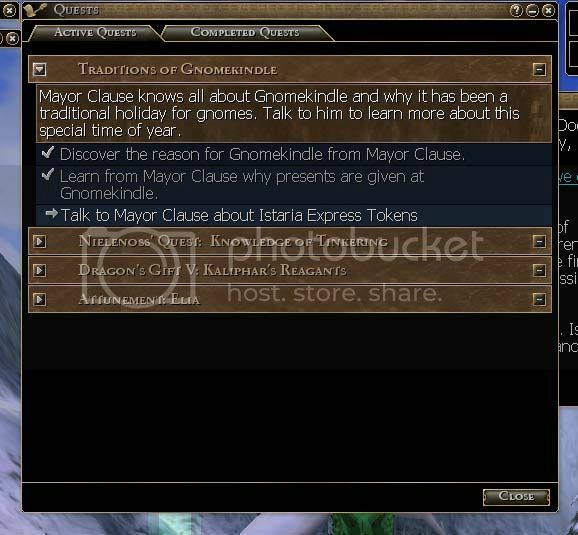 and there we have the quests available from mayor clause. next time, we will meet hermey the misfit gnome, and find out what work he would like us to do for him. see you soon! we interrupt our regularly scheduled post for an important announcement!! 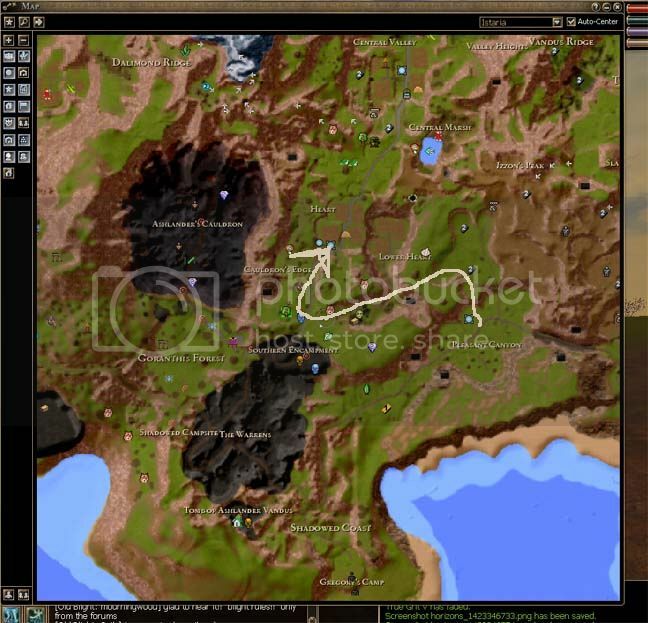 new trismus, the newbie training island, has been lost to the withered aegis! the inhabitants have fled, for the most part, and the town has been razed!!! New Trismus - City Under Siege! The once idyllic town of New Trismus has come under attack by forces of the Withered Aegis, led by the foul Uddorakh. Much of the town now lies in ruins, but the residents have not given up hope and continue to fight their attackers! New quests, lots of dangerous monsters, and an all-new storyline are available with this fantastic update. Many structures in New Trismus have been replaced with burned out versions of the structure. Machines have been removed from the town of New Trismus itself, though field machines on the island were left in place. 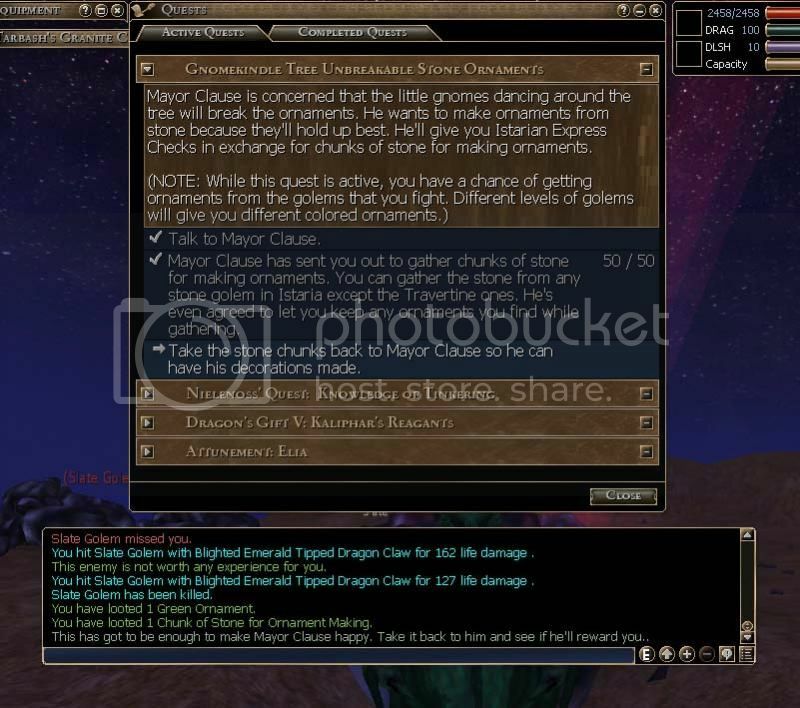 Basic trainers (Warrior, Mage, Cleric and Scout) on New Trismus no longer offer quests to players under level 4. They now send them back to Spirit Island. Many monsters remain on the island, but have had their spawns moved or updated to reflect the changes. 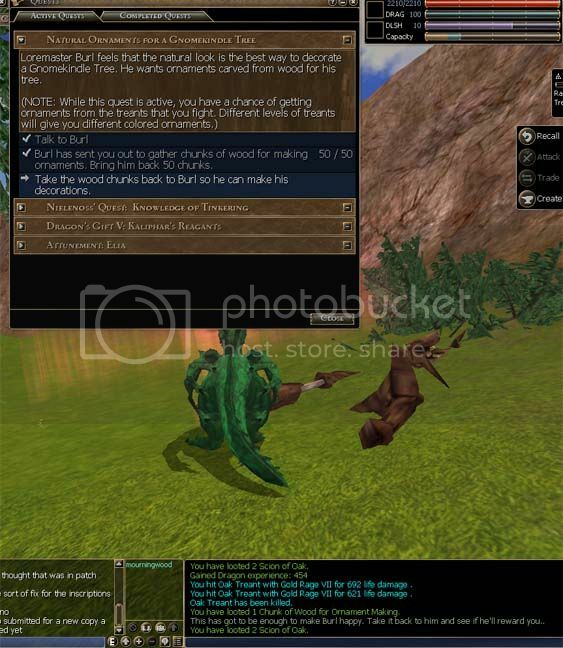 In addition, levels of many wolves, grulets, beetles, etc have been adjusted to fit the storyline quests. The Trials of the Gifted quest has been relocated to Kion along with all of the Assessors. The title reward's buff has been updated to reflect the new level range of the quest. Steward Pratt and Rancher Elden have new quests which can be repeated every hour for characters who are between levels 6 and 12 to provide an experience boost. 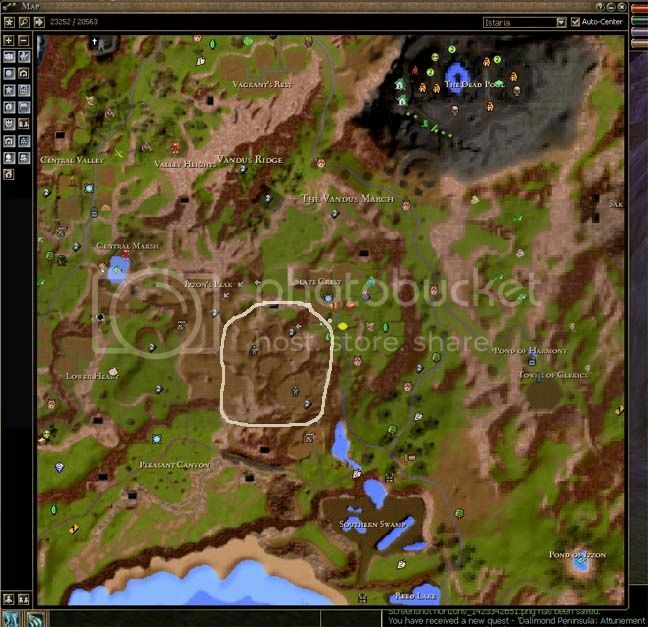 Braekhis has quests which focus on the Ruined Homestead region for anyone level 8 and above. Quest experience and rewards for the tutorial quests on Spirit Island have been adjusted to fit better with the New Trismus changes. A fourth Spirit Isle quest has been added to teach players a bit more about the game and to assist them with reaching level 4. 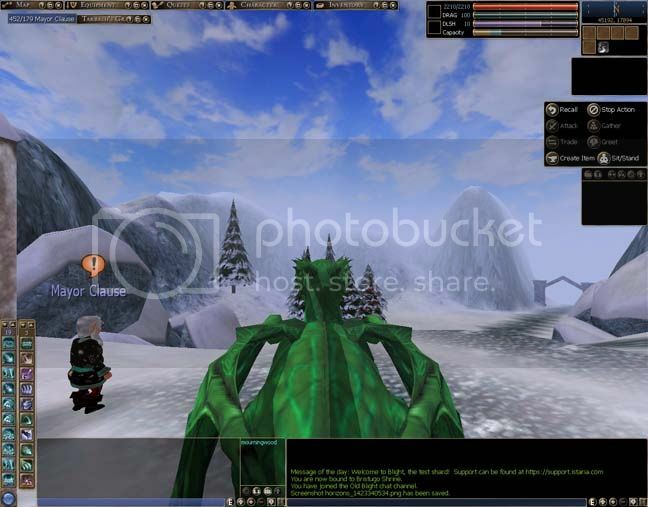 Players may no longer have more than one quest from Steward Pratt active at a time. 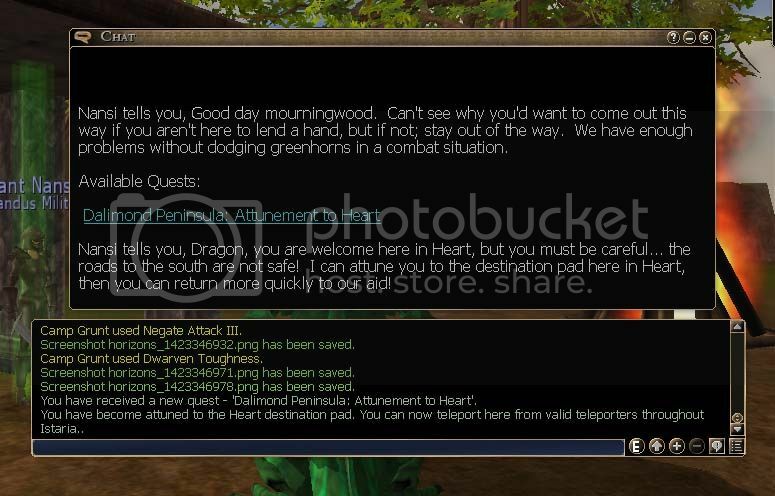 This was causing conflicts with his various quests. Included are the Town Marshall quests that he gives out. 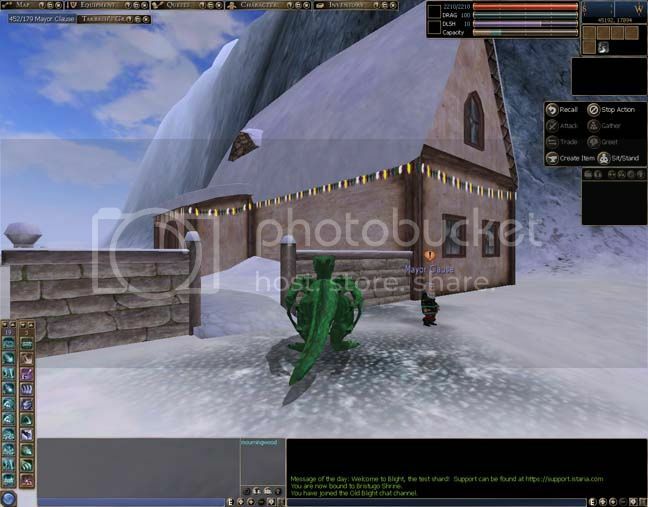 The final quest for dragons coming from Skalkaar sends them to greet Steward Pratt instead of Milicent. i will finish up the series on gnomekindle, then explore the new new trismus, and then we will continue on with our planned series on the biped adventure trainers. see you in the next few days!  as promised, - and a break for both you and me - before we jump back into the trainers (and frankly, i am still working out some presentation things for the adventure trainers series), let's take a look at this year's gnomekindle event. 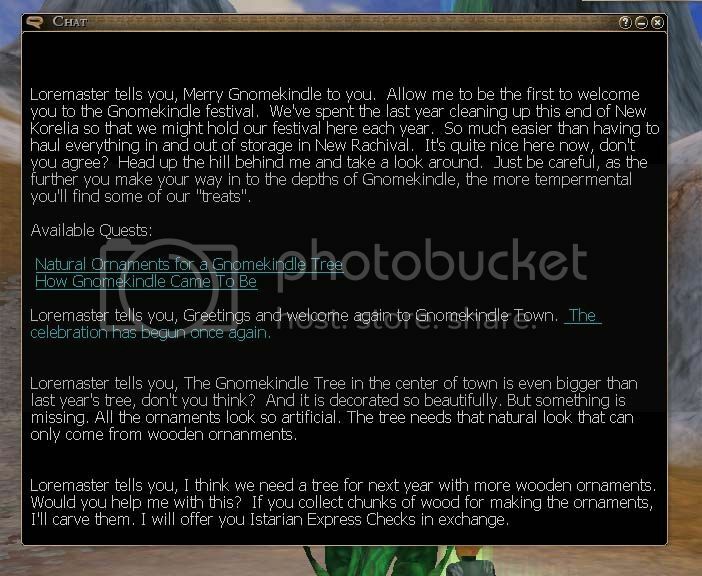 gnomekindle is still ongoing, so feel free to explore on your own. 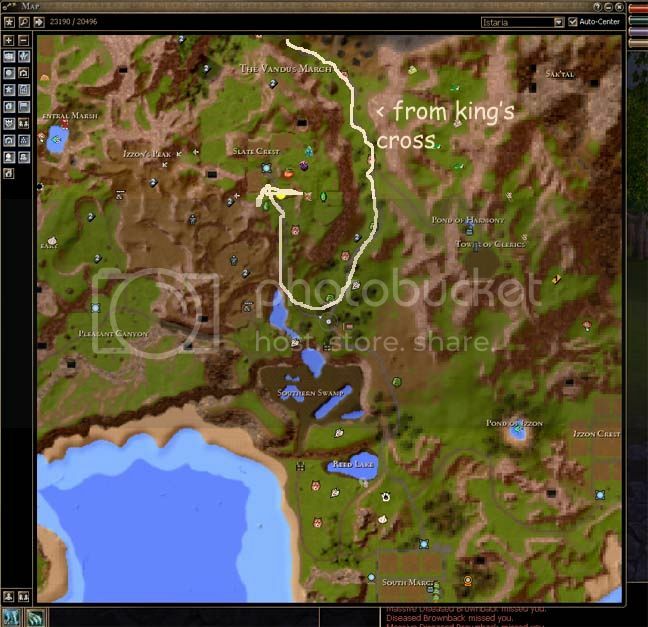 it's a great way to gain xp, rare loot, and explore places you might not ordinarily go. 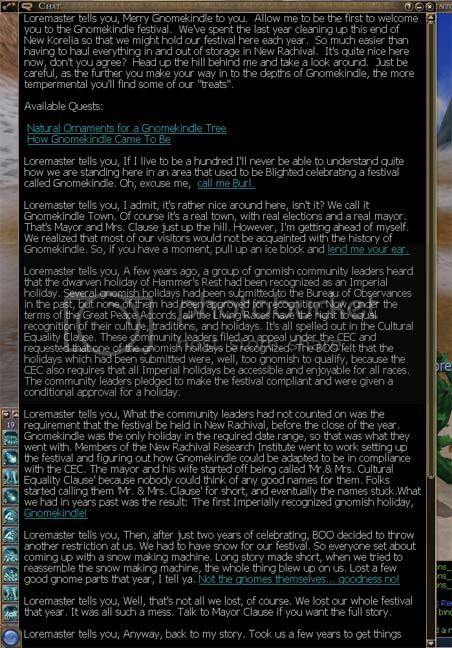 as usual, gnomekindle takes place on new koraelia, winter season port. 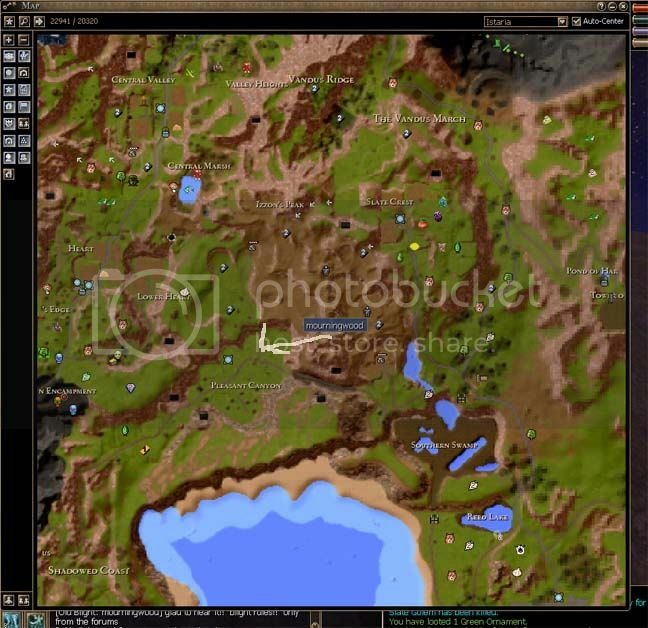 the easiest way to access the port is from genevia (portal in bristugo and some selected racial cities). 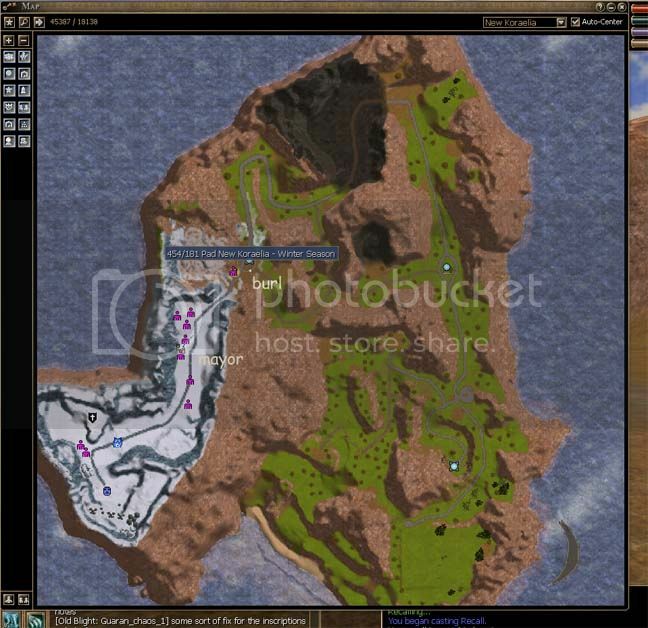 the former training island has been repurposed to host the seasonal events in istaria. to begin (assuming you are starting in bristugo) your holiday adventures, take the main city portal to genevia island. 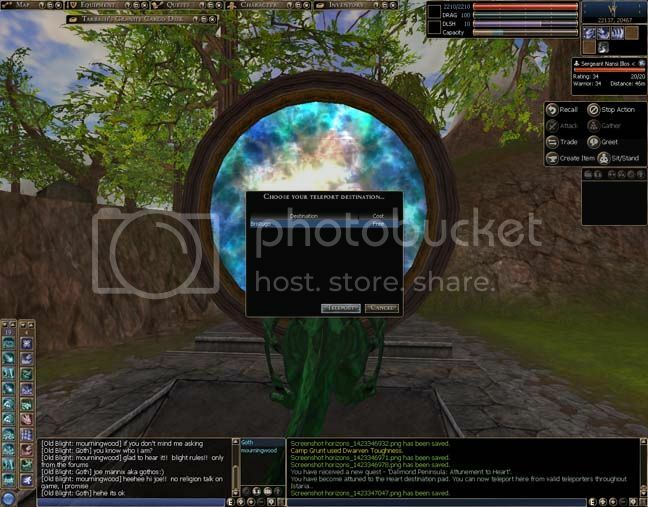 you will see several portals - take the 'middle' one and choose 'new koraelia, winter season' port. when you emerge in new kora, turn to the southwest and you will see your first quest giver - loremaster burl. when you greet him, you see that he has 2 quests on offer. one is a speech based quest, and we will look at that one first. 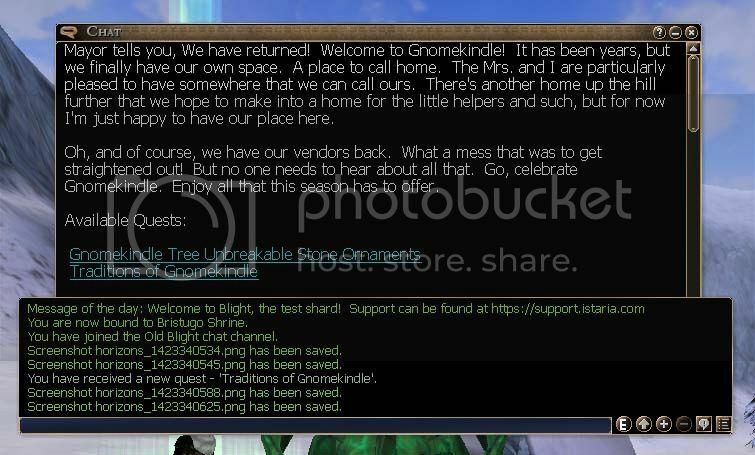 'how gnomekindle came to be' is the story of, what else, the history of the event. greet burl and choose that link. your quest journal will advise you to listen to the story - and it is a long one! once you reach the end of the story, the quest is complete. unlike the next quest, it is not repeatable. 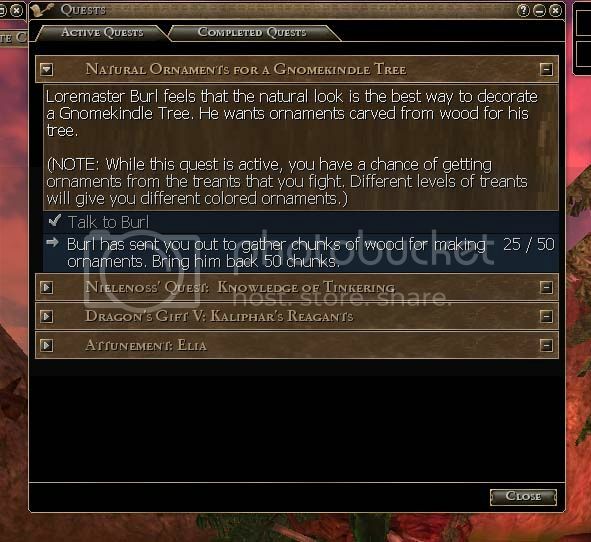 burl's second quest is 'natural ornaments for the gnomekindle tree'. the reward for this repeatable quest is, aside from the looted stuff, a couple istarian express checks. more on this in a bit. 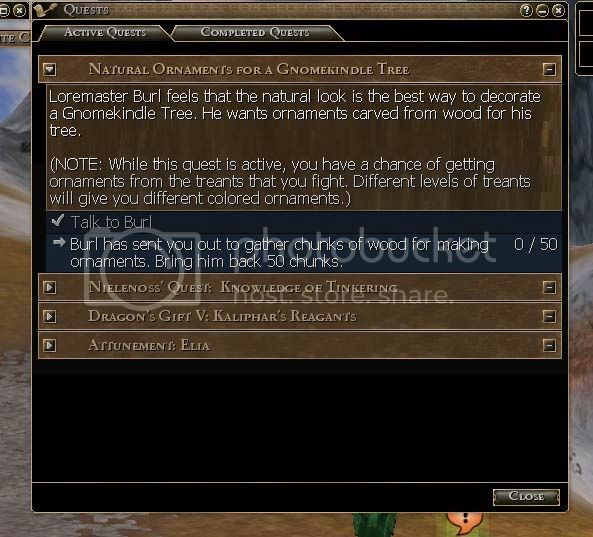 speak to burl and take the natural ornaments quest. as per your quest journal, you need to loot chunks of wood from treants. since i know the area best, and didn't feel like spending a lot of time on this, i went to heather and hunted oak treants. keep hunting until you have the required 50 chunks of wood - you will need to loot them from the dead treants. also loot any ornaments you get - you will see why in a minute! when your quest journal and chat log tell you that you have the needed wood, head back to burl and finish the quest to get your reward. now, about the checks and ornaments. if you continue up the road behind burl and thru the gate, before you get to the town proper, you will pass a frozen pond. around the pond are 5 'color' cashiers and dolly day. since she is the first person we usually come to, allow me to introduce dolly day. dolly accepts your istarian express checks as payment for holiday clothes and stockings (otherwise known as sacks). you can buy complete sets of matching clothing (just to wear, the items do not give any type o bonus), and different colored and patterned holiday stockings, from small to very large. the cashiers behind her around the lake sell presents - from small to large - and shoulder treants. the color of the cashier is the indicator of the color of ornaments they accept as payment. presents hold useful items, like construction materials or boon trinkets - usually one shot stuff. next time, we will explore another quest that gives the chance for ornaments, so between the two quests, i got green and orange ornaments. the green cashier sells green (tier 2) presents and elm shoulder treants, the orange cashier sells orange (tier 3) presents and oak treants. that covers the loremaster and his quests. join me next time, when we will meet the mayor! see you soon.